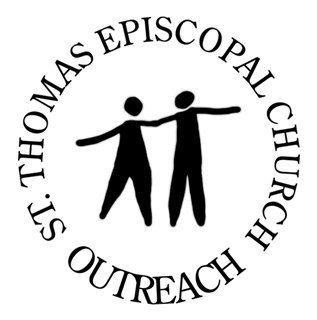 The Outreach Ministries of St. Thomas Episcopal Church for 2018-19 include many partnerships – with St. Thomas School, our Youth Group, other churches, and established non-profits. Outreach at St. Thomas offers opportunities for people with different time availabilities and different passions and interests. Find an outreach activity that appeals to you, and contact the person in charge to find how you can help. Thank you! Volunteers from St. Thomas Church and School meet twice a month to make sandwiches for people who are homeless. We also gather socks, shoes, and backpacks to deliver to people in need. Join us the 3rd Monday of each month from 4:00-5:00 p.m. at St. Thomas. We give service hours! Chapman Partnership provides emergency housing, meals, health care, day care, job training, and job placement. Monthly at the Downtown and at the Homestead facility, St. Thomas provides the cost of a meal and the volunteers to serve the meal. For dates and times to join us, email one of the contact people listed below. Volunteers are needed! Habitat is recognized internationally for its mission of providing low-income families with affordable home ownership opportunities. 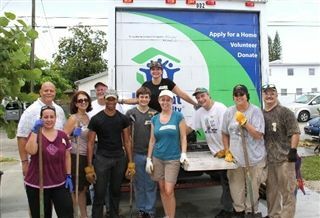 Habitat’s “Blitz Build 2019” is scheduled for February, and St. Thomas is participating. Welcome volunteers! St. Joan’s regularly collects toiletries, books, clothing, handmade items, children’s gifts, and other items for homeless people. The Knitting Group knits scarves for homeless people, and after the earthquake in Haiti, knitted hundreds of Comfort Dolls for children in Haiti. St. Joan’s also donates to food banks and to non-profits that serve needs in the community. St. Thomas provides supplies and gifts for newborns to age 2 through the Jasmine Project, sponsored by the University of Miami Miller School of Medicine's Department of Pediatrics and Healthy Start Coalition of Miami-Dade. Join in Christmas giving by taking a child’s name from the tree during late November or early December and providing a gift of $15 to $20. 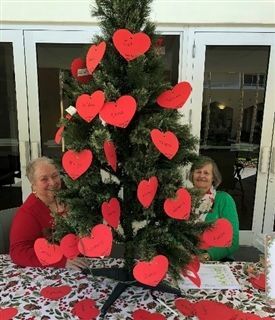 Holy Comforter Episcopal Church and St. Thomas are sister parishes in Miami that have built a sustainable and lasting companionship in outreach ministries. In the heart of Little Havana, Holy Comforter offers a day care center for infants through age 6, a daily food distribution program for homeless people, and low-income senior housing. 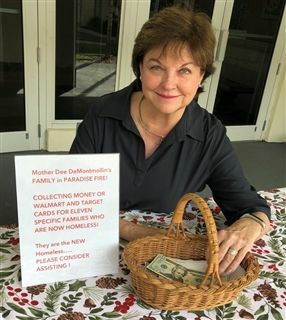 St. Thomas Parish – Church and School – have a long partnership in major outreach that responds to critical needs in that community. 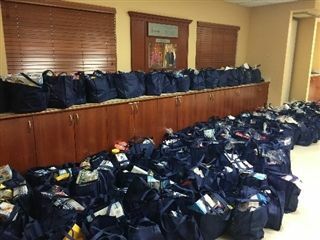 Food bags at Thanksgiving for the homeless people served by Holy Comforter, and food bags at Easter for the residents in Senior Housing are major projects supported by all ages at the church. 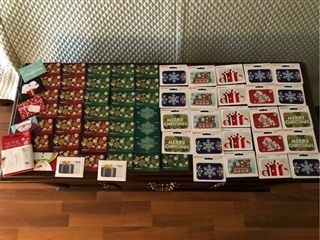 After the December fires in California that devastated the town of Paradise, St. Thomas collected $2,500 for gift cards to the stores that had survived. The recipients were 11 families who were the staff at the veterinary clinic of the niece of Mother Dee deMontmollin, former associate rector of St. Thomas, and who had all lost their homes. The First Communion Class brought canned goods for the bags going to Holy Comforter at Thanksgiving and participated in a discussion about how we can help people who can’t just open their refrigerator doors and find plenty of food. 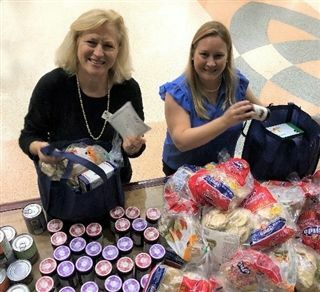 In November, the Youth Group prepared bags of water and an energy bar to be handed to people on the streets who walk past the cars asking for money for food.